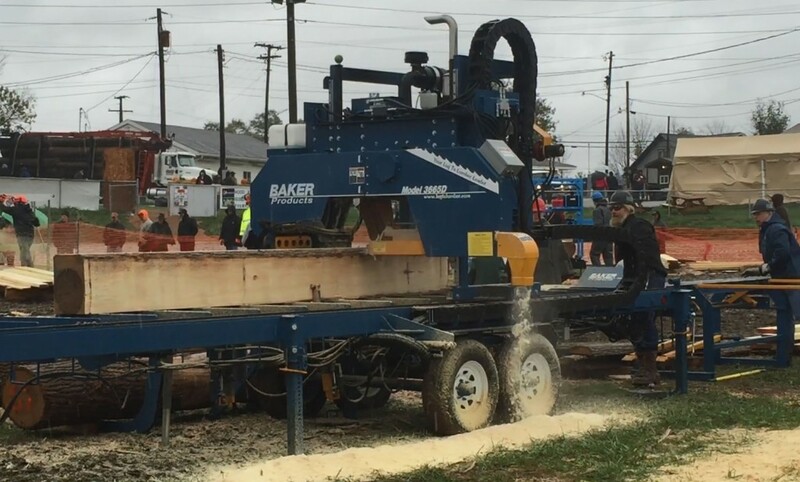 A cold and rainy October day did not dampen Baker Products’ spirits (or performance) in this year’s Sawmill Shoot-Out at the Paul Bunyan show in Cambridge, Ohio. The team of sawyer Hank Somer and tailman Clay Hedrick operated a Baker Blue Streak 3665D mill and a KASCO Maxx-7 blade to out-shoot the completion at this year’s event. Baker Products and KASCO blades earned first place honors in the hydraulic mill category by sawing their way to an impressive production rate of 1,273 BF/hr and a production overrun of 1.07. For the competition Hank Somer brought his new Baker Blue Streak Model 3665D from New Hampshire where he runs a one-man sawmill business. The Baker Blue Streak Model 3665D is a 65 HP Cummins diesel powered band mill that offers a cutting capacity of 36 in. x 20 ft. (D x L). His blade of choice was KASCO’s Maxx-7 blade. KASCO’s high-performance Maxx-7 blade features an aggressive 7-degree hook angle and 7/8” tooth spacing. Hank runs this blade on a daily basis and claims he hasn’t found any other that outperforms the Maxx-7 blade from KASCO. Ask your distributor for KASCO WoodMaxx blades and their new Maxx-7 profile . Contact Baker Products for more information on their complete line of equipment.